Misuse of available screen estate – Navigation drawer is not done right and taking away too much of the core experience of the app – navigation drawer is meant to be transient. Also everything looks stretched-out and blown-up which make readability and glanceability become really bad. 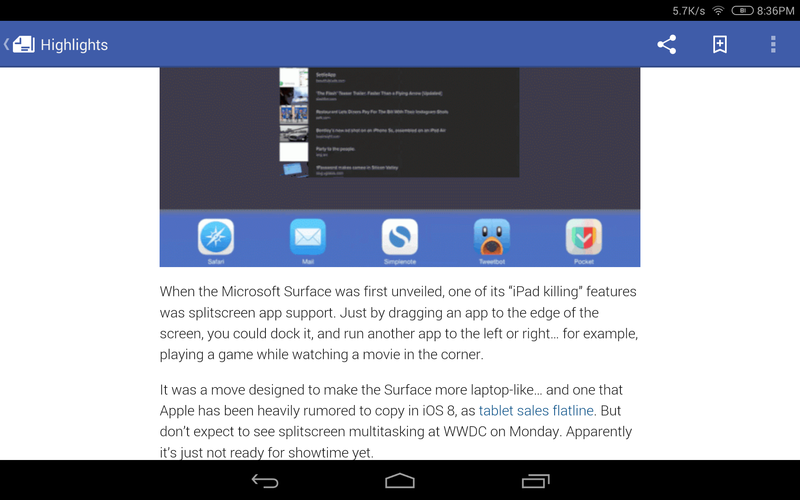 Lack of Pure Android Experience – It’s 100% iOS experience – Tabs at the bottom, right caret, iOS top bar etc. There are certain UI and interactions elements really unique to Android to provide the user the best and pure Android experience, and this shouldn’t be taken lightly if you care about the user. Lack of attention to details – Even for an untrained eye, it’s pretty obvious that the icon and text wasn’t aligned in a proper way – Mind the gap. Terrible tablet experience – Rather than a blown-up version, a multi-pane layout should be already considered if tablet is meant to be supported. We are currently living in a multi-screen world that we are no longer performing daily activities only on the computer, but also on the smartphone, tablet and TV. Of course, this does not apply to every single activity, but most of your digital activities can be done on any devices, and thus, there is always a chance that your user will try to accomplish a task using your app/service with any screen at any time. Unoptimized tablet experience would mean a missed opportunity – for the brand, for the customer experience, and for the customer loyalty. And with the huge market share by Android tablet, it is probably no-brainer to pour in a little bit more efforts to optimize the tablet experience (unless your app/service does not make sense on the tablet at all) because tablet has penetrated in many users’ live faster than you could imagined. What’s make a good tablet experience? 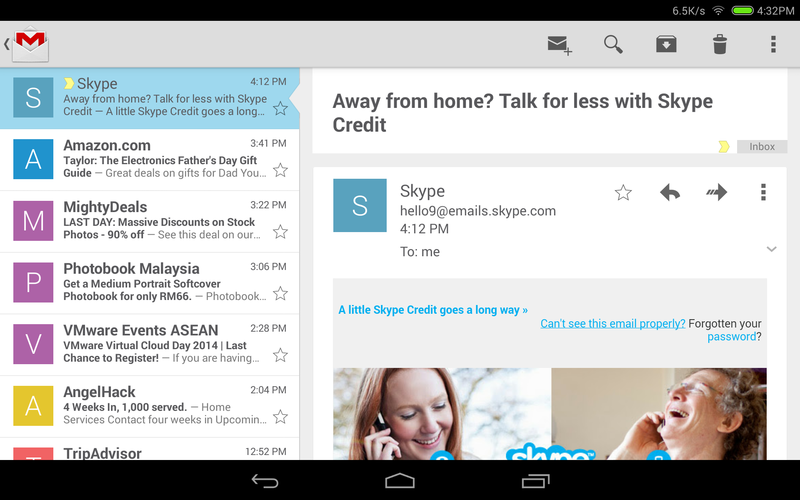 Gmail app is a great example showing that multi-pane layout works really well for tablet, especially for apps that have a list/grid view and a detail view. This will enable the content navigation for the user while still provide the full experience on the content details. With the available screen estate, especially the horizontal screen estate in Landscape mode, it is crucial to optimize the content density to show the user more information on screen at one time. Of course, this doesn’t mean that you have to show the information as dense as possible – finding that balanced density is very important (and tricky) – and this optimization must be able to enhance the content consumption experience (the user consume more information with the same amount of effort compared to small screen devices), and if it’s not, it is probably mean that the content density optimization doesn’t work. It is important to design the app with great tablet experience for the user to appreciate the screen estate available on the tablet, not just treating it as an enlarged phone. 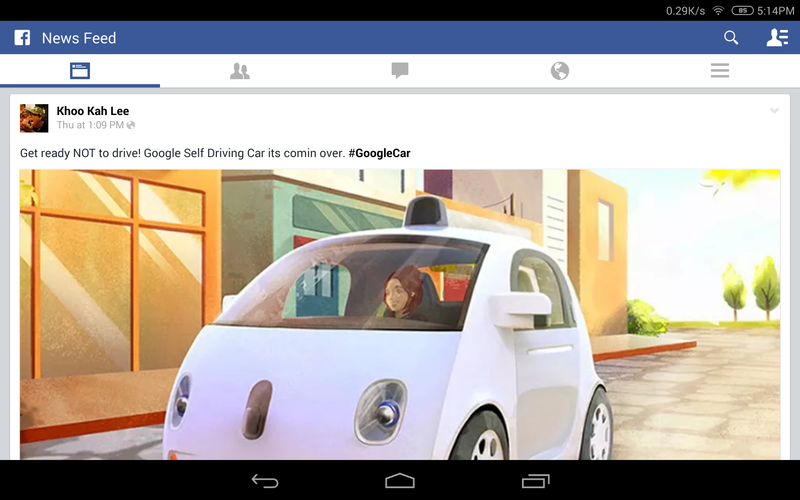 Compared to the Facebook app, Google+ able to show more information at the same time, fully utilize the available screen estate. 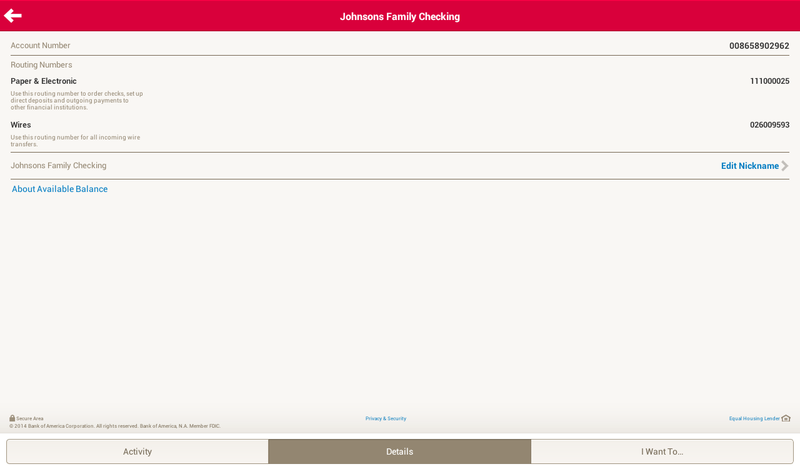 If you look at the screenshots of the Bank of America app, you will find that you will have some difficult time to connect the information on the left and the one on the right, because the readability is not optimized due to the stretched layout, causing the severe disconnection between the information on both sides. In the above screenshot, it is a good example showing why you should not fit the content (especially texts) as much as possible because you would also want to make sure that the readability is great (here, of course, we talk about the optimal line length), so the user can have great experience during the reading (or content consumption). If you app will be used by tablet users, always design the app with tablet experience in mind (as shown above) and make full use of responsive design. Besides that, Android team has written a nice checklist for tablet app quality, so you definitely need to go through it to ensure that you are providing the best quality and experience for both phone and tablet devices. I hope this post is able to inspire and motivate Android developers and designers to optimize the tablet experience and it should not be an afterthought in app development. If you have any comment or question, feel free to leave it at the Comments section, and I should be able to respond accordingly. More high quality tablet app! 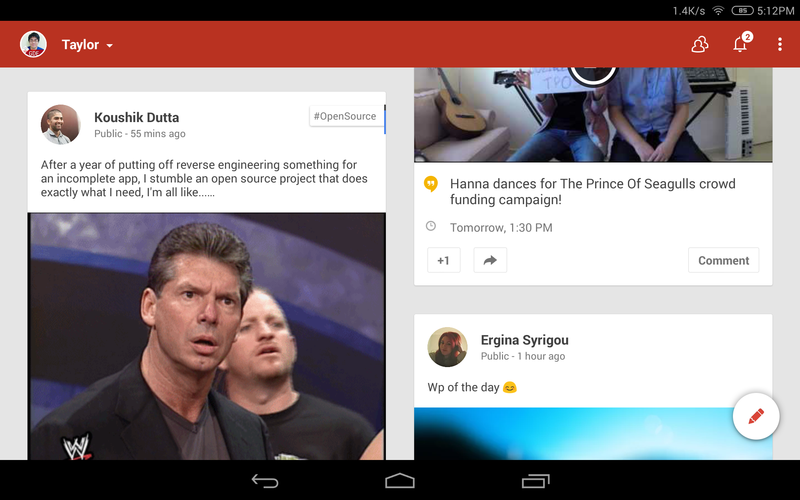 With Google+ on Android just updated with new navigation menu and ditched navigation drawer, this article might not be applicable anymore in the near future for Android Design, though I don’t think navigation drawer will be phased out very soon. Finally, Gmail on Android has been recently updated with the proper Navigation Drawer interaction pattern (the lower-level edge-swipe drawer access, as well as the Settings/Help/Feedback placement), and I am pretty happy about it because we can finally talk about consistency for this design pattern (I am aware that Google+ and YouTube on Android have yet to change). 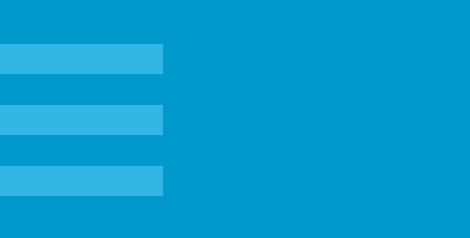 I am sure you have (if you always look around for UI/UX articles) come across this article about how navigation drawer reduces half of the user engagements or why or how to avoid hamburger menu – if you are not, I would suggest you to read them – these are some interest reads. Although for the Zeebox case, I couldn’t fully understand the decision to go for navigation drawer – it was pretty obvious that navigation drawer is not needed, and I would probably go for the QuickReturnTabs (in the current Twitter app) to regain some of the screen estate – though it’s appreciable that their A/B testing indicates that obvious helps. These articles (and I think there are more in the wild) suggest that side menu is a bad design pattern and avoid it at all cost, but I say – in Android Design, you can absolutely use it, but only if it’s really necessary and it’s an informed design decision. In iOS, particularly iOS7, the side menu does clashed with the navigation element (back button) at the top left, as well as the edge-swipe that will act as back (which is not consistently implemented in all Apple apps if I am not mistaken, correct me if I am wrong), however, this is not the case with Android. The navigation drawer for Android is much more sophisticated where the edge-swipe is reserved for accessing the navigation drawer at any lower-level screens (discoverability could a problem here I know), making the top level navigations slightly easier and more accessible even though you are at the deeper level in the app structure. This potentially eliminates the Platform Navigation Pattern Clash mentioned in Luis Abreu’s post (of course he meant in the iOS7). I do agree with Luis Abreu about Information Architecture optimization when you are tempted to use Navigation Drawer for your app – Navigation Drawer isn’t simply an answer for every navigation need. It is always good to rethink from a high level perspective about the app structure to find out whether the navigation can be made a little bit shallower by removing any unnecessary level/information that doesn’t help exposing the important content to the user – in Android Design Guideline, there is a pretty nicely written recommendations for app structure. However, if it’s really necessary to use the navigation drawer as the top-level navigation pattern after careful consideration, just do it, and do it right. It’s not that I do not encourage variations (which is great for a platform), but for UI elements that involved heavily with interactions, it will be always good to stick with the one that is recommended in the design guideline for consistency, familiarity and predictability. We always want the user to ‘learn once, applied everywhere’, especially from an Operating System point of view – I hate to say this but it’s part of the responsibility of the Android developers and designers to help pushing this established* consistency so the user will have less interaction friction when they are shown with a specific UI element. The faster the user able to operate the app and achieve what they want to do = happy user. *I know some of the Google apps are still yet to be consistent with the latest changes in navigation drawer, but I am sure they are working on it. Mind you that navigation drawer has come a long way and it takes time to get things right (I wrote about this back in 2012)! In Anthony Rose’s article about Navigation Drawer and a tweet by Luke Wroblewski below shows that when the navigation pattern is less obvious, the user engagements reduced (although I am not sure what’s the parameters in Luke’s chart). Sure, for some, these statistics seem worrying – but I don’t think we have yet to see the whole picture in these examples. What does the reduced user engagement means? Does it mean they don’t explore the app anymore or it simply means the first screen (home screen) is already sufficient? Does it mean that the user accomplished what they want to do with the app much faster (with lesser distractions) and thus less engagements? I would probably see this as an achievement if my app is meant to help in productivity because it might means that my app helps the user achieve thing faster. While I fully agree that we should keep “what’s out of sight, is out of mind” as one of the design principle, but it doesn’t mean that we have to show everything as long as we can, because every UI elements play different role during the user interactions and each of them have it’s own unique importance. So next time when you come across the use of navigation drawer, make sure it is really necessary to do that – and the new Google+ app just show that Navigation Drawer is not really needed sometimes. I ended up hiring one of the finalists in last years competition. I hired him to do a bit of freelance work on an app I’m building – so it would be good to give similar encouragement to upcoming designers. Frankly, I didn’t expect that. The aim to make such design challenge is always meant to create awareness towards the importance of Android Design, and it seems to go beyond that – it’s totally awesome! 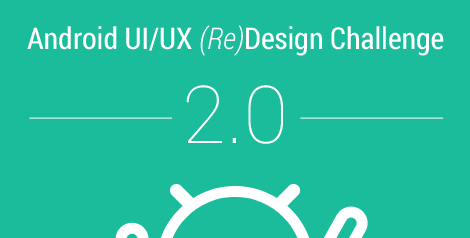 This is why I decided to make the second one, namely Android UI/UX (Re)Design Challenge 2.0. But first, I have to apologize to all the participants last year for the undelivered Android UI Design Kit Logo stickers – there has been some issues with the sticker quality and hence I decided not to ship any of them. I will look into options this year to make good quality sticker (any suggestions?) and I will send them out again. 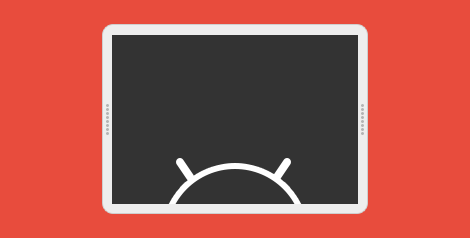 The (re)design should use Android Design Guideline as a reference. Only use appropriate UI patterns and building blocks for your design. At least 5 screens are required (in order to tell the app flow/structure). Please provide comparison/explanation/justification for each screen. A good example of the design entry. Don’t let us guess! I repeat, don’t let us guess! App icon can be redesigned to match with the new UI (re)design. Optional: You can design for the Android Wear version if it meet these design principles. If it’s not, don’t do it! Optional: Making animated UI design (in animated gif or video) is encouraged, but it will not have huge advantage in the judging system. Optional: Feel free to post your design to any Google+ Android Design Community (including Android Designers) to get feedback and further improve your app (re)design before your final entry. It’s always encouraging to see such design iterations which involved communities. Five best entries will be announced via my Google+ account and androiduiux.com after the deadline. They will be also informed via email. 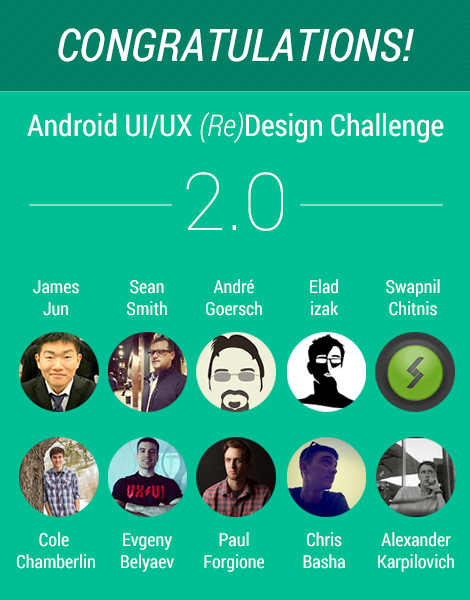 All entries will be judged by awesome android designers in order to pick the winners. Domo Arigato Mr. Roboto T-shirt. This is a new T-shirt campaign that I just launched for Android fans. If the Teespring campaign is not successful, I will print these T-shirt myself and ship them accordingly. 10 USD Google Play Store Gift Cards. You can request to make it a Paypal transfer if the Google Play Store Gift Card in USD is not usable due to the difference in region/currency. That’s all! If you are interested, start (re)designing and submit your awesome design entry by 18th April 2014! Other than that, there are also two new files in the Design Kit: An Android Holo Color Collection swatch (complete with all different levels), and a document containing link to some libraries for development. One of the reason to include such document is to introduce the Android UI Design Kit users about some nifty libraries that the developers can use to achieve the design in the mock up — which hopefully can easily synchronize the design idea between the designer and the developer. You must first install both Roboto and Roboto Slab fonts before using the Design Kit. Initially I was very tempted to charge for this new update since it does taken up part of my free time, however, I changed my mind eventually — I wanted this to be used by everyone that is designing Android app using Adobe Photoshop (and now GIMP), either professionally or as a hobby – so charging a price might be able to grab me a cup of coffee or two, but I am more obsessed with the download number (can you believe that?) and the social connections I made from providing this download. So it will be remain as a Free Download. However, if you think I deserve to have a cup of coffee from the work that I have done, you can always support me via Paypal, so that I can maintain the energy to produce awesome stuffs for the community. As usual, I have made this new Design Kit available at my MediaFire account. File size is larger this time around, but I can’t seems to compress all the awesomeness to a smaller archive size. There is also an updated Android UI Design Kit for Photoshop 4.4 at Nexus 5 resolution (1080×1920), so if you prefer to design in a larger size with latest UI elements, grab that as well! Since there are some new UI elements in Android after Google I/O, I have decided to spend some time to update (and optimize) the Android UI Design Kit. There are some new UI elements added into it (and I removed some most-likely-unused UI elements). Besides that, I have also added some Quick Start PSD file that contains some main UI elements like Action Bar, Tabs, and Navigation Drawer, so the user able to choose not to start the design with the PSD file with all Building Blocks. And yeah, it finally come with Landscape orientation as well! Android UI Design Kit 4.3 for Photoshop and GIMP is here! After I published Android UI Design Kit for Microsoft Powerpoint last month, I have gotten some really nice feedback about the usefulness of the design kit in a tool that they are easily familiar with, and some of them show interest in a Google Slides version. I had a look into Google Slides back then, and I was decided not to do a Slides version due to the lack of Roboto font available in Google Slides (perhaps I missed it back then, but I didn’t see any other extra fonts). After the Google I/O, I discovered that it is possible to use Roboto font (only Regular and Condensed, but they are already sufficient for mock up purpose) in Google Slides, therefore I went ahead and try to convert my PPTX Design Kit to Google Slides, thinking that it will be just a 10 minutes work – turn out it wasn’t that trivial. Apart from missing UI elements and text misalignment which can be easily fixed, the main issue is about the output. When I export a mock up screen from Google Slides to PNG format, it always seems to be slightly off from the ideal resolution (768×1280), and in Google Slides, there is no option for the user to change the slide size. So I ended up spending the whole morning doing micro-adjustment on the slide size in Microsoft Office, then upload to Google Drive and convert it to Slides, in order to find the best fit size that can export the screen at perfect resolution. Similar to the Powerpoint version, most of the building blocks (Action Bar, Buttons, Radio Buttons, Progress Bar etc.) are inside this Design Kit, including the new Navigation Drawer indicator. This Design Kit is highly optimized for Google Slides in order to have a proper output of image resolution. It has been tested with offline mode, so you can work on some app design mock ups whenever you want! I have uploaded it to Google Docs Template so you can immediately use the template in Google Slides (Please access the template on desktop browser, or if you are on mobile, request a desktop site. Apparently Google Docs Template page doesn’t work with Mobile Browser Agent): Android UI Design Kit for Google Slides. Don’t forget to rate and share it if you find it useful!